This photo is from the Edward S. Curtis Collection at the Library of Congress. It is described as Hidatsa Indian posed, head and shoulders, facing right. It was taken circa 1908. 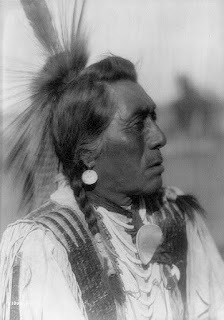 The Hidatsa are a Siouan tribe living near the confluence of the Knife River with the Missouri in North Dakota. Their language is similar to that of the Crows. The name, Hidatsa has been said to mean 'willows.' The Hidatsa have also been known as the Minitari and Gros Ventre. Today the Hidatsa, along with the Arikara and Mandan (known as the Three Affiliated Tribes), reside on the Fort Berthold Reservation in North Dakota. You can find a lot of historical information about the Hidatsa, along with the Arikara and Mandan at the MHA Nation website. Just follow the link below to learn more.